To access a Master Roadmap that has been shared with you, visit your Shared With Me panel on your Roadmap Home. 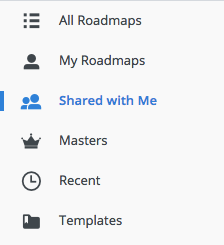 Any user you share your Master Roadmap with will have View-Only access - however, if you share your Master with the Owner of one of your Source roadmaps, that Owner will be able to make changes to the Items they own from the Master Roadmap. Remember: All changes made to Source Roadmaps will be reflected in the Master roadmaps, and Account Admins can freely make changes to all items on a Master roadmap, and those changes will be reflected in the Source roadmaps. Just like other roadmaps, Masters can be Exported to PNG, HTML and URL. Owners of a Master, as well as Account Admins, can export the Master to CSV. For more details on Exporting a view, check out this article. Who can export a view? Unlike roadmap items and milestones, anyone with access to a Master roadmap can export its views to PNG or HTML, including the roadmap's Owner and users sharing the roadmap as an Editor or a Viewer.